We decided quite late in the day that we wanted to add some bread to the Saturday night dinner menu. My first thought was corn bread however we lacked sufficient milk to make it work. So we turned to beer bread. Beer bread uses leavening agents (such as baking powder) instead of yeast. This recipe produces a fairly dense bread. This recipe is based on one I originally found on the Hannaford Supermarket website. Their link no longer works; this one appears to be a similar recipe. Really it was useful for the ratios of ingredients since we didn’t use onions or rosemary. Preheat the oven to 375°F. 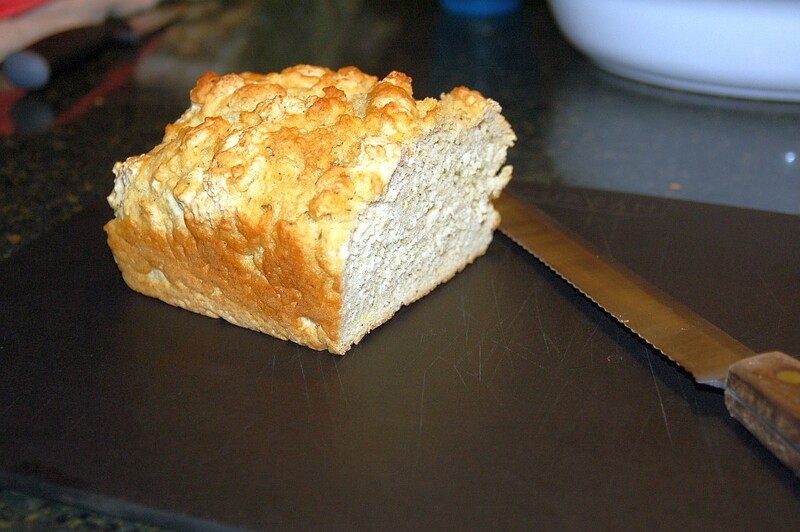 Coat a 9-by-5 inch loaf pan with cooking spray. In a large bowl combine the flour, sugar, baking powder, salt, pepper and cumin. Mix well to combine. Add the beer and chopped herbs to the dry ingredients. Stir, gently at first, to bring everything together. You shouldn’t see any dry ingredients when you are done however it will look lumpy. Transfer the dough into the loaf pan and spread it out fairly evenly. Drizzle the olive oil over the top of the dough. Bake for approx. 50 minutes (rotating the pan half way through). A toothpick should come out clean when stuck into the center of the load if it is fully baked. The top should be a nice golden brown as well. Cool the bread for 4-5 minutes before removing from the pan. Allow to cool further on a cooling rack. As with most loaf bread it will be easiest to slice this loaf if you let it cool completely before slicing, as least 90 minutes in a well ventilated space. This bread has a bitterness to it that may not appeal to everyone. That bitterness comes from the beer. We used an American wheat style beer in this loaf because that is what we had available. Most of the recipes I came across suggested a lager-style beer (think mass produced American beer). You could use almost any carbonated beverage in place of the beer, from soda water to Moxie. This entry was posted in Baked Good, Recipes and tagged baked goods, bread, cumin, oregano, thyme by Bob Gill. Bookmark the permalink.